An esophagectomy (say "ee-sof-uh-JEK-tuh-mee") is surgery to remove all or part of the esophagus. 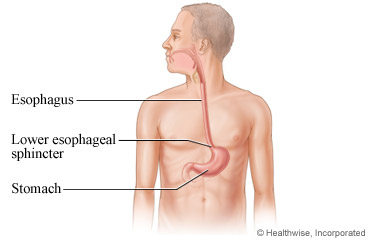 The esophagus is the tube that carries food from the throat to the stomach. Nearby lymph nodes and other tissue may also be removed. The doctor connects the remaining healthy part of the esophagus to the stomach so that you can still swallow and eat food. This surgery is mainly used to treat esophageal cancer. But it can also be used for other problems with the esophagus. During the surgery, the doctor makes large cuts in the belly and the upper chest or neck. These cuts are called incisions. Where they are depends on where the problem is. After surgery, you may be in the hospital for 1 to 2 weeks. You have to be very careful about what you eat for 1 to 2 months after surgery and maybe for the rest of your life. You may have a feeding tube (J-tube) in your belly when you go home. This is to be sure you get enough nutrition. This will come out when you are able to eat normally. How long this takes varies. For many people, it takes 4 to 6 weeks after surgery. Your doctor will give you detailed information on your diet and how to use the J-tube. You may feel weak after surgery. Take good care of yourself. Get enough rest and stay active. This can help you heal faster. You will probably need to take at least 6 to 12 weeks off from work. This depends on the type of work you do and how you feel. You will need more time to get better if you need other treatment for cancer, such as chemotherapy. Having cancer can be scary. You may feel many emotions and may need some help coping. Seek out family, friends, and counsellors for support. You also can do things at home to help you feel better while you go through treatment. Your doctor can guide you to many local resources for support and more information. Call the Canadian Cancer Society (1-888-939-3333) or visit its website at www.cancer.ca for more information. The surgery will take 3 to 8 hours. Enter P936 in the search box to learn more about "Esophagectomy: Before Your Surgery".